The 2nd Annual Collective Music Conference | Oct. 5th-7th, 2017 - TheUrbanMusicScene.com | Concerts & Festivals! 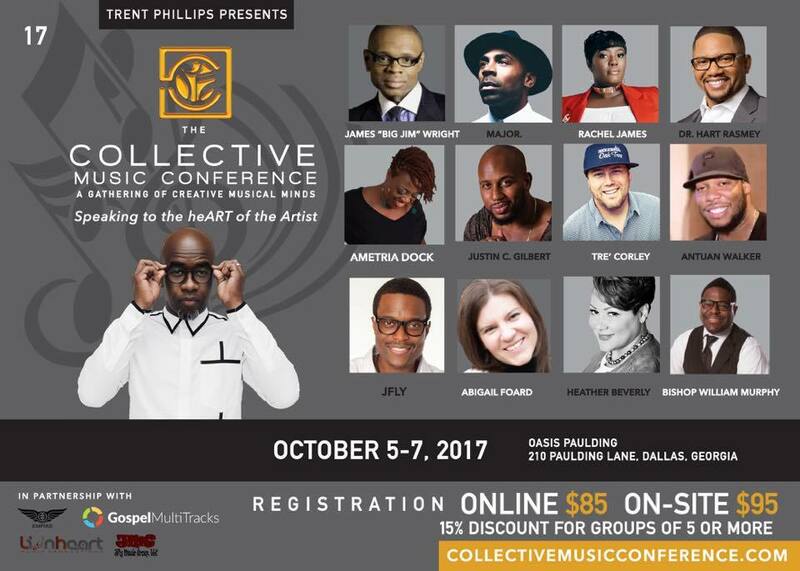 ATLANTA, GA – – Award winning producer Trent Phillips Presents… The 2nd Annual Collective Music Conference. The Collective is a creative space where musicians will connect, be informed and be inspired by some of the most well-respected leaders in the music industry. The Collective seeks to enhance the creative arts nationally and internationally by supporting professional, touring musicians and artists across various musical genres, touching urban communities, and giving back through musical, technical and life education. This year’s conference is held in Atlanta, Georgia at Oasis Church, located at 210 Paulding Lane, Dallas, GA 30132. On Friday and Saturday, October 6-7, 2017, The Collective Music Conference will host two full days of general sessions and workshops, including stellar presenters and special guests including Award-Winning producer James “Big Jim” Wright, NAACP Image Award nominated chart-topping recording artist MAJOR., Instrumental Artist/Producer Justin C. Gilbert, Award-Winning producer Tre’ Corley, clinical therapists Abigail Foard and Dr. Khaalida Forbes, Pastor & Instrumental artist Dr. Hart Ramsey, vocal producer Rachel James,entertainment attorney Heather Beverly, ESQ and Bishop William Murphy to name a few. On Thursday evening (October 5), the conference opens with a meet and greet & musician shed, which is open to the public. On Friday evening (October 6), The Collective Mixer, a live music experience held at Vinyl at Center Stage, will capture the true essence of entertainment featuring MAJOR. and several other amazing artists. Mixer tickets will be on sale for just $25 at the door. In its second year as an organized conference, The Collective looks forward to impacting upwards of 1,000 creative millennials from all over the USA and beyond. The Collective Music Conference has an established social media impact exceeding 2 million followers, most of which are millenials. General registration (online) is $85 and on-site registration is $95. To register please visit www.collectivemusicconference.com/registration/.